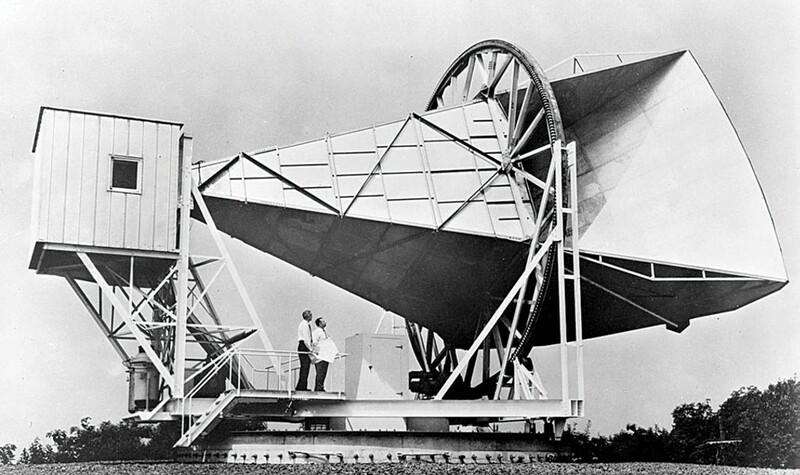 Photo courtesy of NASA Bell Telephone Laboratories' horn antenna in Holmdel, New Jersey, with which Arno Penzias and Robert Wilson (shown in this 1965 photo) first detected the cosmic microwave background, thus providing the first hard evidence for the "big bang" paradigm. Cosmologically speaking, everything changed in May of 1965, when two radio astronomers working for Bell Labs detected a faint whisper of radiation, a fossil relic from the birth of the universe, which pretty much clinched the "Big Bang" theory. The irony is that they weren't even looking for it, but they won Nobel Prizes anyway. Such is serendipity in science. The radiation they found is formally known as the "cosmic microwave background," or CMB. Its discovery provided hard evidence for a violent, explosive origin of our universe — derisively dubbed the Big Bang by cosmologist Fred Hoyle (neither big, nor a bang!) — which started it on the road to expansion (and thus cooling) that brought it to its present state nearly 14 billion years later. Astronomers had known for nearly a century that the universe was expanding, mainly thanks to the pioneering efforts of American astronomers Vesto Silpher and Edwin Hubble. They discovered that galaxies and clusters of galaxies are speeding away from each other in an ever-expanding matrix of space. By imagining this scenario as a movie and running the film backwards, we can visualize space as initially compressed to a tiny "singularity," the nature of which still eludes the best efforts of cosmologists. What they are confident of, though, is that 380,000 years after the Big Bang, the stuff of the early universe had cooled sufficiently for atoms to form, allowing previously trapped radiation to travel freely through space. The radiation from that time, the CMB, is what Arno Penzias and Robert Wilson unwittingly stumbled upon half a century ago while testing a supersensitive "horn" antenna to listen for faint radio waves bounced from balloon satellites. After eliminating all interference (including clearing out pigeons and their poop from the inside of the horn), they were still picking up a mysterious background noise at microwave frequencies (corresponding to about 3 degrees above absolute zero). The weird thing, from their point of view, was that the noise was omnidirectional, coming evenly from all over the sky. The possibility of detecting the CMB had been proposed a couple of decades earlier, although its "temperature" after traveling 14 billion years through expanding space was a matter of contention. Just 40 miles away from their antenna in Holmdel, New Jersey, astrophysicists at Princeton University were planning to build their own microwave receiver to look for the putative CMB. A mutual friend mentioned their efforts to Penzias who phoned the leader of the Princeton group, Robert Dicke. It was a momentous call: Dicke had a theory but no evidence; Penzias and Wilson had the evidence — aka "noise" — but no theory. The story goes that Dicke put the phone down, walked over to his team and said (with what must have been very mixed emotions), "Well boys, we've been scooped." Until that phone call, cosmologists had argued over two competing paradigms to describe the early universe, the static "steady state" model (the universe looks much the same now as it has always looked) and the dynamic "Big Bang" model. Penzias and Bell's discovery of the CMB pretty well ended that debate ... only to start a bunch of new ones. Nearly 50 years later, our understanding of the early universe has barely begun. Barry Evans (barryevans9@yahoo.com) notes that Hoyle thought the whole idea of a Big Bang undignified, like "a party girl jumping out of a cake."